When we first purchased our late 1800's home back in 1998 every room of the house was covered in wallpaper and shag carpeting. We went through each room of the house, little by little, stripping off the wallpaper and re-doing the floors. As the kids grew older, our little 1200 square foot house became a little snug, so in 2003 we began to build an addition that doubled the square footage of our house. Every single thing was done by ourselves. We did not hire contractors. Now that the kids are grown up and have all moved out of the house, it is time to make our home fit our needs for this stage of our lives. Last year I redecorated my son's old room and turned it into a "Beauty Room" for myself. It is where I store the current season's clothes and also where I put my make up on and get dressed for the day. I did an entire series of posts starting HERE if you'd like to see them. When my husband and I finished our "Beauty Room" he said "Next year, we'll remodel our room and make it a little love nest." Well I was really surprised by that, because my husband never suggested remodeling a room to me before! I honestly didn't even think our bedroom was that bad. But after he suggested it I looked at our room with different eyes. It really did look dated. He was right. A remodel was in order. Step 1: Ask yourself what you want out of this room. So now it was time to plan! Planning is the first step of any renovation. We first had to ask ourselves what did we want from this new room? We wanted it to be romantic, comfortable, and functional. We really loved the style of my new beauty room, and wanted to incorporate some of those ideas into the Master Bedroom. We also loved our hotel room in Las Vegas, and wanted to take some ideas from there as well. Step 2: Start looking for ideas. The first place I go to for ideas is Pinterest. Now when I pin from Pinterest I look for images that I am attracted to. I realize that the space I have to work with is far different from the space in the image. It's just a "look" that I hope to replicate in my space. And it won't even be exact, in fact, in the end it might not look anything like the original image. There could just be one small element from the original image that I use in my room. Here are just a few master bedroom images I pinned from Pinterest with an explanation of items that I am attracted to in the room. 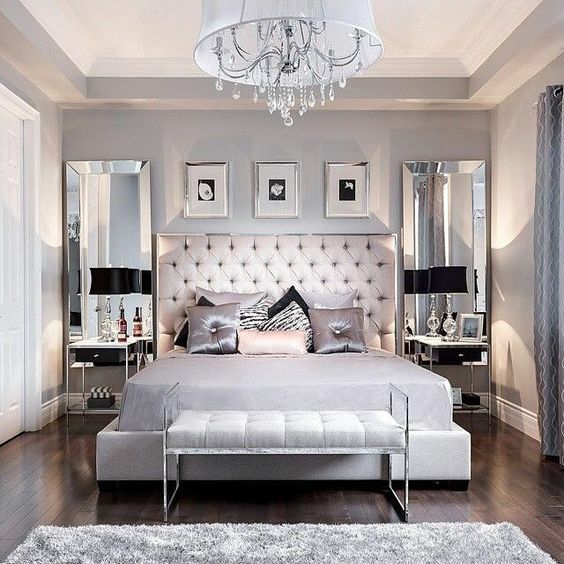 I love the colors, the unique mirror, the nightstands, the mirrored dresser, the lamps, and the bedding. What I don't like is the drapes. They look dated and too frilly for a man to sleep in this room. I also don't care for the three pieces of art work above the bed. I love the bed in the picture below. It is very masculine to me. I also love the brick wall. What I don't like? Way too simple and understated to me. The bedroom pictured below is my favorite of the three. It is absolute perfection and if I could re-create this look exactly in my room, I would. What do I love? Everything! There is not a single thing wrong with this room. It has the forties glam look I'm going for. I love the mirrors on either side of the bed. The color is masculine, yet a girl would feel perfectly at home here as well. The drapes are modern and perfect. All the chrome is gorgeous! LOVE, LOVE, LOVE the bed. And I really like the small touches of black to balance out all the femininity. This room is the perfect balance of masculine and feminine to me. Now that I found my inspiration room, it is time to figure out how I can achieve this look in my small space. My husband and I took measurements and walked around the room discussing various scenarios and layouts. We came up with a plan, only to scrap it entirely and go with an entire new plan once the demolition of the old room was done. But I want to talk more about that next week! With my ideas floating in my head, it was off to the stores! The first thing I had to find was the bed, because that was not only going to be the focal point of the room but I also needed to know colors and measurements before I could paint the room or buy anything at all. I ended up buying this bed at Ashley Furniture. 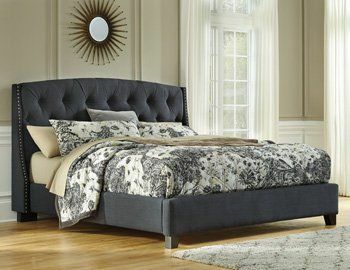 I decided on this bed because it had the upholstered look I was going for, the dark color was masculine, and it was small enough to fit my room. I love this chair at T.J. Maxx and it's definitely in my price range. I'm sure it won't be there when I go back in a few weeks, but hopefully they'll have something similar. These end tables are super cute. 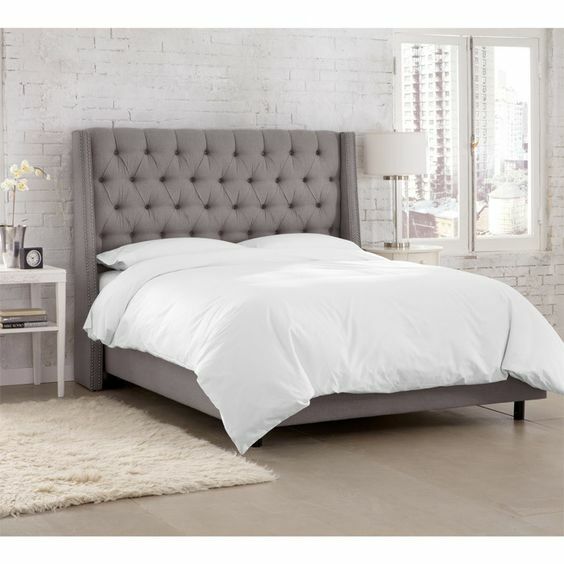 I love the silver and the style, but I was worried they might be a bit too flimsy for night stands. This dresser at Ashley Furniture is to die for, but it also comes with a hefty price tag of $1000. I just don't want to spend that kind of money on furniture. Maybe I could find something similar at a thrift store and paint it? Next I shopped for paint and flooring. Because the bed we purchased is so dark, we really need to go light on the walls. 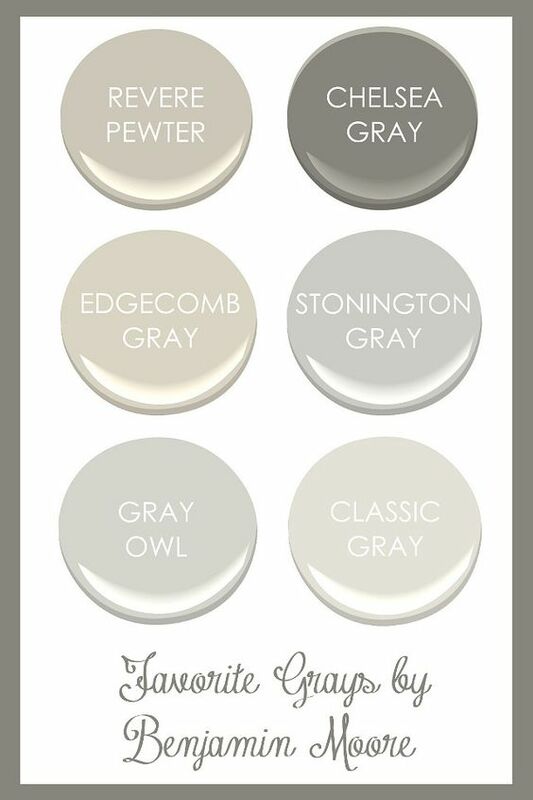 I'm thinking of something like the Revere Pewter in the upper left corner of this graphic. My husband and I really like how this flooring has both grey and browns in it so it will coordinate well with the colors in our room, the new brick wall, and the colors in our hallway and bath (as we will put this flooring in our upstairs hallway as well). We also liked the wider plank. Next week I will share the demolition process of our room, and our new "faux" brick wall. Those are some pretty inspiration photos! Can't wait to see how your bedroom comes along. I too want to re-decorate ours, but I first need to get rid of stuff! Thanks Ellie! You would die if you saw how much I've taken to Goodwill the past two weeks! We've accumulated a lot of stuff since 1998! Like your ideas and Pinterest pics. I need to work on ours this year so I'm going to be following progress closely ... and maybe stealing a few ideas! Thank you! I hope I'll be able to give you some ideas! This will be fun to watch your progress! Thanks Karen! I'm glad everyone is so excited about this series! Wow, what a different look you have planned for the bedroom. Love that your hubby suggested the renovation. And that you are both looking to make this room romantic! Thank you! Yes, I was surprised he suggested it too! Exciting! Love the inspiration room. I am looking forward to following your renovation. Thank you! That's good to hear!